“Taylor may be the freshest Zydeco act to come along since Beau Jocque..."
"Curley’s first CD - Country Boy - is a powerful effort, but as the son of Zydeco great Jude Taylor I'd expect no less. The singing is good, lyrics have meaning, good melody and the band is tight! His sound is fresh and invigorating." "Curley Taylor gave an intimate performance to a packed crowd..."
Steeped in the traditions of his birthright and emulating the Zydeco greats, Curley is forging his own path with humbled grace, charm and a syncopated rhythm that simply won’t quit.... Curley and his band are on a mission to draw in a wider audience." Curley Taylor and Zydeco Trouble put on a memorable performance Saturday at the Waterfront Blues Festival. Taylor and the rest of the band were even more fun to watch than the dancers...Playing any instrument is an art, certainly, but Zydeco Trouble takes it to the next level." 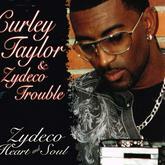 "Curley Taylor has been a zydeco modernist.... his fourth CD [Zydeco Heart and Soul] is his most groundbreaking yet. He’s part of the movement ushering in a new era of zydeco.... It’s not even close to your father’s zydeco, but Taylor aims to be your zydeco daddy." I replied with matchless enthusiasm, "They are greater." Some describe Curley Taylor as a rising star, but to be candid, he is a star that has already risen. His incomparable talent as a musician is a rarity. Taylor's "skill and will" to succeed is unbelievable to those who don't know him. If the elevator to success would break down, Taylor would take the stairs."